You will, as you drive around north and east Norfolk, pass these all over the place. In fact you’ll find them all over the county as you will tank blocks and mortar spigots, even the odd trench line still exists all still protecting us from a long dead, now non-existent threat. Norfolk was seen as one of the most likely areas to be hit by an enemy landing, it’s seen ships nose in and disgorge invaders before, over a thousand years ago. 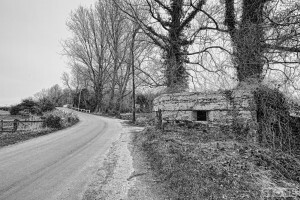 This one is another fairly typical Type 22 Pillbox; reinforced concrete and brick, it sits in the bend in the road from Brampton to Oxnead forming part of one of the naturally easier to defend stop lines that are rivers. It’s an old trick, look at Bishop’s Bridge in Norwich; the whole flank of a city protected not by a wall but by a river. A useful tactic; minimum work is needed to build a protective line, unbelievably even here in its upper stretches; the Bure was still naviagable as far as Aylsham in 1912 when the flood washed the locks away, now it ends at Coltishall. But narrow as it is crossing here even a river the size of this would be difficult for all but the most mobile foot troops and impossible for anything on wheels and difficult for tracks. The plan always was to blow the bridges and then this pillbox could provide both direct and enfilade fire from it’s position under an old tree along the length of the river. It’s in a sad state, again the brick coat has stripped, the damp of the valley bottom, the freeze and thaw, the sun, expanding and contracting the top coat has caused most the top half to fall away leaving the skeleton of concrete underneath. This is the archaeo-future, I often find myself standing next to them and wondering how much longer they’ll last.